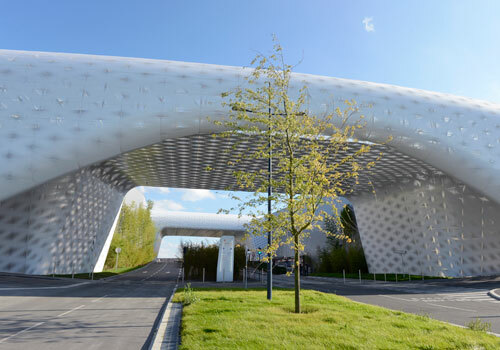 All the bespoke double curved perforated aluminium panels required to complete the spectacular archways over the road entrances to the hugely impressive L’Atoll retail complex in Angers were designed and manufactured to automotive precision standards by UK freeform curvature specialists, Formtexx. The complex houses dozens of shops and restaurants which are located on either side of a continuous perimeter promenade and in a series of pod units imaginatively set within ornamental gardens that surround and disguise a large central car park. 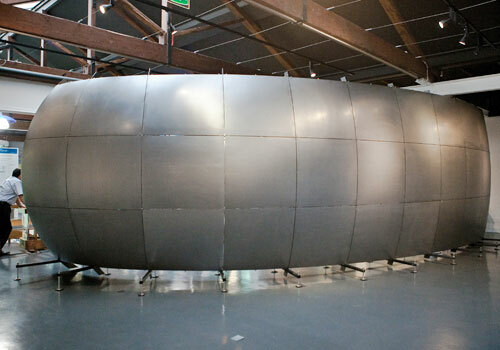 Formtexx double curvature technology was first launched to over 200 members of the architectural and construction community at The Building Centre in London where this 10 x 3 metre high freeform display wall was installed in the entrance foyer.